Last week when I wrote about my class reunion, it hadn’t yet happened. I thought I would report a little more on a fun night for those of you who can’t decide whether they should attend the event from their high school. It might change your mind. 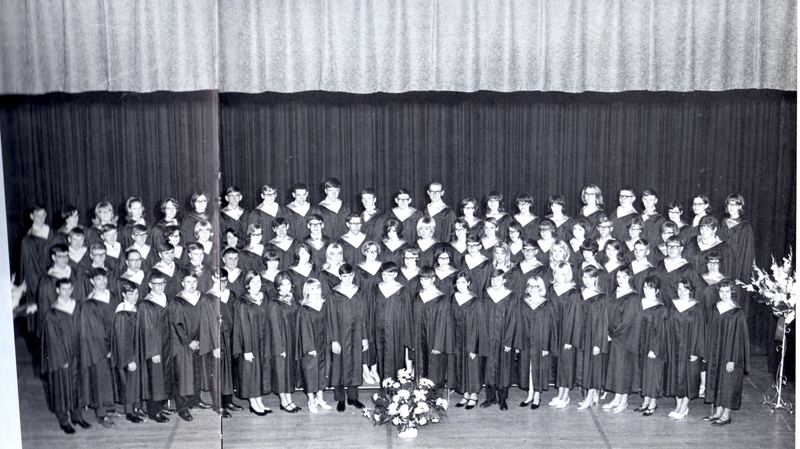 The class of 1968 of Wells-Easton High School had a good turnout and people attended from as far away as California and Florida. Some we hadn’t seen since we graduated 50 years ago. But at this reunion, I felt as if something extraordinary happened that only the universe could put together. Friday before the reunion, my friend Vicki and I received a message with a picture from a classmate’s wife who resides in Missouri and was not attending the reunion. The picture was a class ring with the year 1968 on it along with the initials WHS and BL. She had seen the picture on Facebook posted by a friend of a friend. She did not know the person posting but thought perhaps the ring might belong to someone in our class, although they could not think of who had those initials. I read the message and immediately thought of my classmate Brad Lines who lives in California and who I have contact with on Facebook. I messaged him the picture and question in the post: Does this ring belong to anyone in Minnesota? It was found somewhere in Minnesota. Brad messaged me back. He thought it was his ring. The ring was lost 50 years ago at a camp in Paynesville. He called the woman. She lived in Paynesville. The interesting part of this was that he and his wife, Jill, were just about to hop on a flight to Minnesota to attend our reunion. They had decided not to attend but changed their mind the previous week and booked a flight. When they arrived in Minnesota they drove to Hutchinson, met the party who found the ring and made it back in time to join a happy hour that afternoon with our class. After 50 years, he was again wearing his class ring — on another finger because as you well know as we age our body tends to grow, meaning our fingers expand in size. We also found out on class reunion weekend we were history in our museum. The Wells Depot Museum was honoring the class of 1968. We found our pictures (they had my picture from kindergarten in a showcase along with three other kindergarten classmates, which were better than some of the class pictures I wouldn’t have wanted seen), articles from our time in school and letter jackets, GAA shirts, articles of our accomplishments, etc. Whoever thought we would be museum pieces, although I must say I am already officially an antique. A ruler from my dad’s shoe store with my writing and my name and grade three on it were found in an antique shop in Iowa a few years ago. Antique store plus museum must make me a relic. I won’t add my classmates to that designation as I don’t want to offend them and risk the wonderful comradery we found at the reunion. We savored the moments we spent together and hoped our 17 classmates who have passed were having a heavenly reunion with each other, too, as we felt their presence when candles were lit and moments of silence were observed to honor them. It couldn’t have been more fitting for Brad to get his class ring back the same weekend of our reunion. It filled us all with amazement, gave us more to ponder about the universe that keeps calling us back together. We reminisced with those who used to be our best friends, became better friends with those who were acquaintances in high school and because we all had a good time decided to not wait for another five years to meet again. We are going to call it a 70th birthday party. In two years we hit the magic age and what better way than to celebrate it with those who shared the beginning years of our lives? Our class motto was: “Those conquer who believe they can.” We believed, we conquered and 50 years later we are still going strong. Note: I have been the Monday columnist for the Albert Lea Tribune since around 2005. That is so many columns. I am delighted they want to keep me on, and so I will be moving to Thursdays. It is also a time to rename my column Sprinkled Notes, which is what I use for my blog, which can be located at sprinklednotes.com. Haven’t been back since my fifth (Barrington High School, Barrington RI,’74)When most of your male classmates spend the night asking how your sister is?…gets old fast.